Over the past two years, after the death of my mother, I have become increasingly interested in learning more about the origin of my family, their emigration to the US and their previous lives in Italy. Both of my parents are now deceased, as are all but two of my father’s siblings. Traditions, language, recipes and connection to family are receding from memories, as the extended family grows larger and further apart.
. . . My work is often drawn from forms and patterns found in nature. The patterns of the lace are no exception as many suggest plant-like structures. 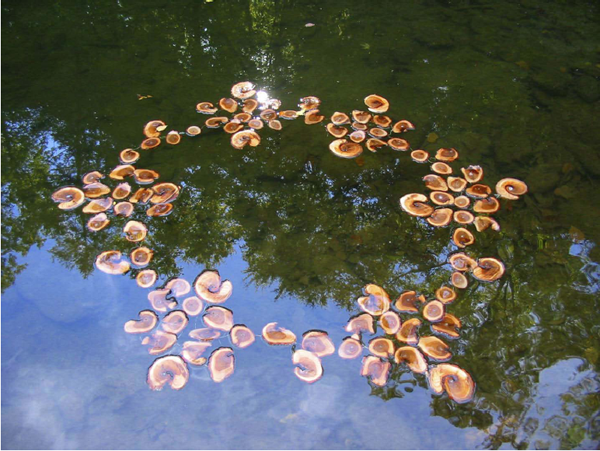 I have recently had several opportunities to produce ephemeral, site- specific installations using natural materials within a landscape. I anticipate that the mixed media work I would produce in Calabria would be influenced by the unique natural landscape as well as by an investigation of cultural traditions and family roots. I am employed as an art instructor and work with students ages 12-15 throughout the school year. As a teaching artist, I am willing to present workshops to students in Italy that will highlight the concepts, techniques and experimentation with mediums that are prevalent in my work. Nancy agati: "Ottanta Sette". 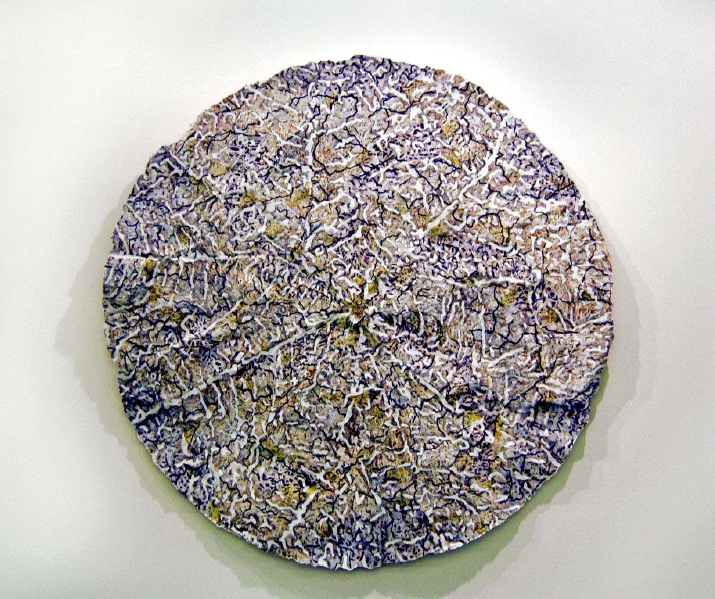 Lace Patterns sewn with metalllic thread on parachute cloth, 5’ diameter -variable, 2011. Ottanta Sette was sparked by a collection of antique lace and doilies that I found amongst my mother’s belongings, some of which were given to her by my grandmother. 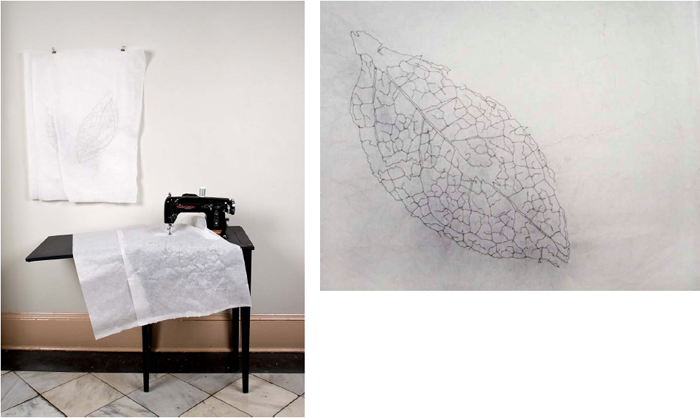 For this piece, I enlarged and traced the lace pattern, altering the drawing so that each design is different from the next. 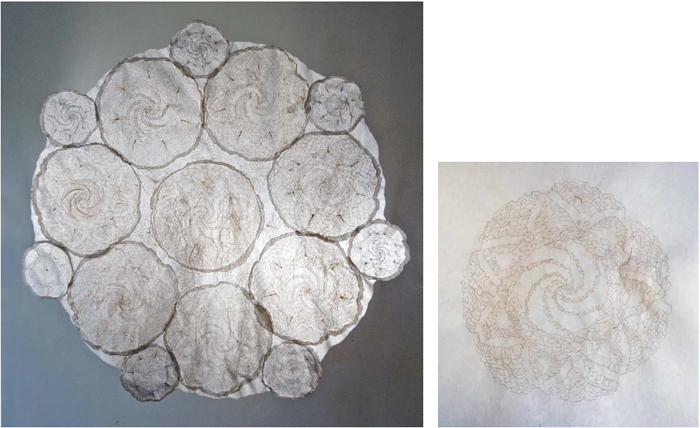 These drawings were sewn on translucent cloth with gold and silver metallic thread; then pieced together like a tapestry. The work was done on my mother’s old Singer sewing machine, the one on which I was taught to sew as a child. Bravissima, bellissimo il pezzo “Untitled (Floating).” di derivazione neoimpressionista o meglio se vuoi parte richiamando Monet e va oltre al richiami dell’impressionsmo francese del primo novecento. Complimenti.